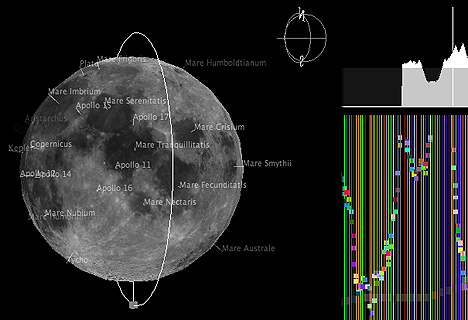 Moonbell is an automated music generator that plays musical scores based on lunar topographical data obtained by Japan's Kaguya (SELENE) explorer during its orbit around the moon from late 2007 to June 2009. Moonbell, which was developed in cooperation with the Japan Aerospace Exploration Agency (JAXA), has two playback modes: "Orbit Play" and "Free Scratch." Click the buttons on the bottom right of the screen to switch modes. In Orbit Play mode, Kaguya traverses the moon in a circular orbit and music is generated based on the topography below. This screen displays Kaguya's orbital path, an altitude graph of the topography, and the corresponding musical notation map. Use your mouse to change Kaguya's location and orbit. 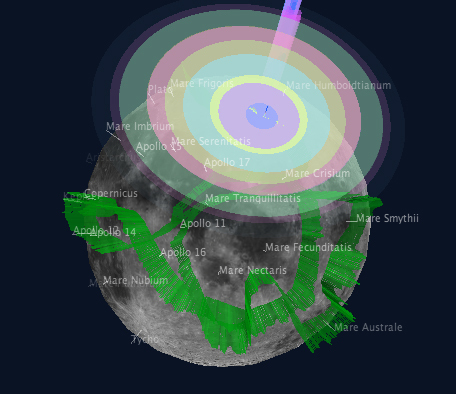 In Free Scratch mode, you can use your mouse to chart a path across the moon's surface. The corresponding music plays in a loop, regardless of how long the path is. The notes are visualized as different colors and patterns on the screen. To tweak the audio output, click the "Preference" button on the bottom left of the screen. This opens the settings panel, where you can choose from 128 musical instruments for each track, change the playback speed, set the volume for each instrument, and more. See the "About" page for a complete description of all of Moonbell's functions and controls. Nice, but the site does not run andI have the last latest java plugin! Try a different browser. It stopped working for me in Firefox on Mac, but runs fine now in Safari. 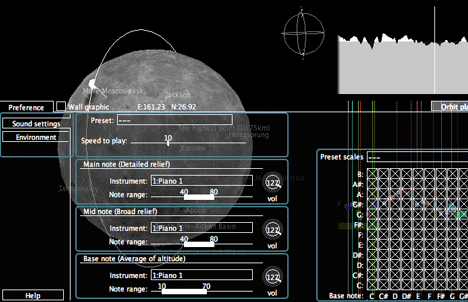 this lunar music generator seems like the terrain is assigned to a range preset scales and instruments. however would this have any similarity to the Wolfram theory of auto-generating music? It is similar to Wolfram's theory in that what is generated must fit to a particular set of parameters in order to be perceived as music. Wolfram describes the generation as requiring some constraints so as not be be simply noise made of tones. Those parameters are given in Mandelbrot's book "The Fractal Generation of Nature". When music, no matter what kind, is plotted as a log/log of the power required to generate the frequencies, loudness and duration of all the notes, they fall into a very close correlation. Dimensional analysis examining the self-similarity provides the parameters which can then be used in a generation algorithm to create artificial music. I don't know if the lunar surface's dimensionality is close enough or if the program here adjusts the data to fit that, but this is a far sight better than the occasional CD that comes out with transformations of time series data such as EEG or radio astronomy observation into sound they claim is "music". As a scientist I find them all interesting. As a musician, this is the only one I find exciting. I'm hoping they'll put in a link allowing people to submit other data sets. Is the lunar generator still down? I've tried this in every browser and still says the page does not exist. Has this been moved somewhere else? .log : ????? ? ???????? ?